Sunshine Village is one of three Banff ski domains, along with Lake Louise and Norquay/Mystic Ridge and is only 20km from Banff. It is the highest of the three, and in terms of accommodation there is the Sunshine Inn, Banff's only ski-in/ski-out hotel, located right in the village area at 7,000 feet. As with most North American ski destinations, Sunshine prides itself on its user-friendliness and its superb snow record - all of its snow is naturally created. It doesn't always live up to its name for sun, but with 400 plus inches of snow per annum, you are always guaranteed skiing. The area has recently expanded to offer more skiing for all. There are good beginners' runs at Meadow Park, while advanced skiers can push themselves to the limit on 'Delirium Dive' and 'Waterfall Run' on Mount Standish. There is also the World Cup downhill run to test your nerves and your carves. The place itself won't win too many plaudits, but the scenery is superb. 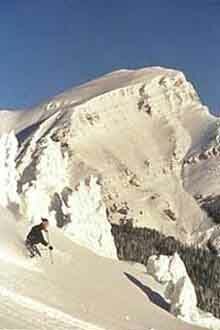 The majority of accommodation is found in Banff, which lacks Alpine ambience and is generally a summer resort. There is a wide range of accommodation, restaurants and fun, lively nightlife. It can get very cold in winter, but in the evenings there are plenty of bars in which to warm up.